An example of how to rearrange UI panes when switching orientations. One thing that becomes clear as you read this advice is that the company doesn't want everyone developing for the Nexus 7 and ignoring other form factors. Android, of course, is designed to scale dynamically to different sizes, resolutions, and orientations. 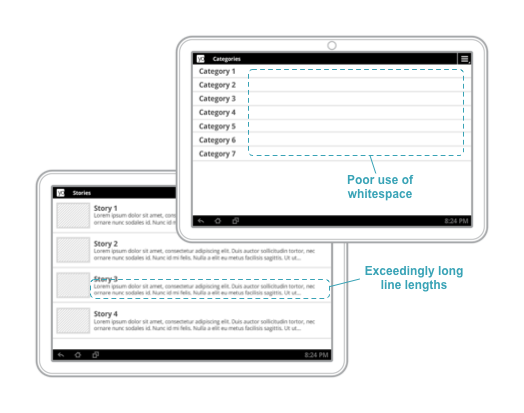 Up until this point, though, the default use-case has been a roughly 16:9 tablet in landscape orientation. Now, the most popular slate position is portrait. What Google wants, however, is for designers to consider both. Writing for just one and ignoring the rest is now officially not best practice. If you're a developer and you're looking into making a tablet UI for your app, head to the source link below. Also, keep an eye on the +Android Developers Google+ page, as the group will be sharing slate-specific tips all this week, including special editions of several developer-oriented shows and case studies. A wealth of information is at your fingertips!